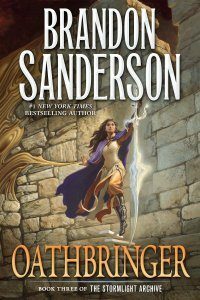 Oathbringer by Brandon Sanderson returned to the top spot on the hardcover list this month, followed closely in second place by Pierce Brown’s Iron Gold (book four of the Red Rising series). Dark State by Charles Stross, book two in the Empire Games series (Tor), was the new runner-up. We had 47 nominated titles, up from 45 last month. Robin Hobb’s Assassin’s Fate (book three in her Fitz and Fool trilogy), barely edged out The Collapsing Empire by John Scalzi to win first place on the paperback list. The new runner-up was Convergence by C.J. Cherryh, book 18 in her long-running Foreigner series (DAW). 55 titles were nominated, up from last month’s 52. The two top positions on the trade paperback list remain the same as last month, with N.K. Jemisin’s The Fifth Season narrowly beating Ready Player One by Ernest Cline to take the top spot on the trade paperback list. There were no new runners-up. We had 74 titles nominated, up from 56 last month. Welcome to Night Vale: It Devours! by Joseph Fink & Jeffrey Cranor moved to the top of the media and gaming-related books list with a respectable lead over the second place finisher Star Wars: The Last Jedi: The Visual Dictionary by Pablo Hidalgo. There were no new runners-up. We had 28 titles nominated, down from last month’s 30. Compiled with data from Bakka-Phoenix Books (Canada), Barnes & Noble (USA), Borderlands (CA), McNally Robinson (2 in Canada), Mysterious Galaxy (CA), Toadstool (2 in NH), Uncle Hugo’s (MN), White Dwarf (Canada). Note: book titles and covers on this page link to IndieBound, a network of independent booksellers, such as those that contribute to this list.